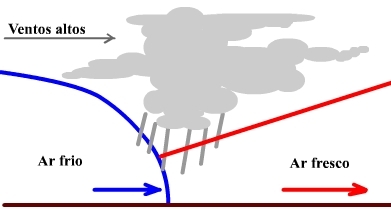 A stationary front is a boundary between hot air and cold air that results when a cold or warm front stops moving. When she returns to move, back to being cold or hot. Usually there is a change in temperature or wind direction that can be seen from one side to the other. Cyclones moving along a stationary front can dump large amounts of rainfall, resulting in significant flooding along the front. If both air masses along a stationary front is dried, there may be clear skies with no precipitation. When there is humid, warm air rises above the cold air, cloudiness with light rainfall can cover a wide area. Cold front is the front of a cold air mass in motion. Cold air, relatively dense, It is introduced under the warmer and less dense air, causing a rapid drop in temperature at ground, followed by thunder storms and also. The rain stops abruptly after the front passage. The cold fronts come to move to 64km / h.
A cold front is a transition zone where a cold air mass (polar, moving towards the equator) is replacing an air mass warmer and wetter (tropical, moving to the pole). The cold fronts moving up the poles to the equator. 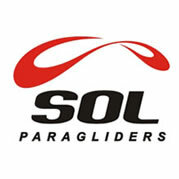 Predominant Northwest, the Northern Hemisphere, and Southwest in the Southern Hemisphere. They are not associated with a smooth process: cold fronts move quickly and force the hot air to rise. When a cold front passes, the temperature can drop more than 5 only during the first hour. When a front stops moving, referred to as stationary front. Cold air brings the hot air in front and this cools as it is bound to rise. Provided it is sufficiently moist, hot air and then condenses to form clusters cumulonimbus, producing a front of storms and heavy loads of water with gusts. The high winds blowing in ice crystals at the top of cumulonimbus generate cirrus and cirrostratus announcing the approaching front. After a forward pass, the sky ends up appearing some clear weather cumulus (cumulus humilis). It also occurs a considerable drop in air temperature, since the cold air mass then passes to dominate the atmospheric dynamics of this region. If the air that rises is warm and stable, the predominant clouds are stratus and nimbostratus, Fog can be formed in the rain area. If the air is dry and stable, the moisture content in the air will rise and appear only scattered clouds, without precipitation. An occluded front (also called occlusion) It is a transition zone where a cold front, moving faster, exceeds (and blocks) a warm front, making to rise all the hot air. Continuous rain characteristic of warm fronts is immediately followed by showers associated with cold fronts. Hot front is the front of a hot air mass moving. The cold air is relatively dense and hot air tends to dominate it, producing a wide range of clouds and a faint, persistent rain and fog sometimes sparse. The warm fronts tend to move slowly and can be easily reached by cold fronts, forming occluded fronts. 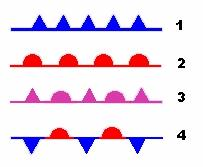 When a front stops moving, is designated by front-stationary. A warm front is a transition zone where a mass of hot and humid air is to replace a mass of cold air. Warm fronts move from the equator to the poles. As warm air is less dense than cold air, Hot air mass rises above the colder air mass and generally precipitation occurs. Oftentimes, a layer of thin clouds (cirrus) It is observed over 1000 km ahead of the warm front surface (some 48 hours before you get to this place). Then come Cirrostratus ealtostratos. 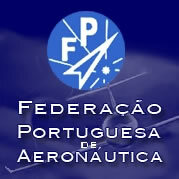 A few 300 km before the front then arise stratus and nimbustratos and eventually begin to fall a light rain. After the forward pass, are observed clusters of good weather. The temperature rises slightly already before the arrival of the warm front, because the clouds locally increase “greenhouse effect” the atmosphere, absorbing radiation from the earth's surface and emitting radiation back to the surface. 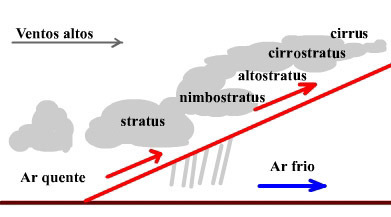 Precipitation associated with a warm front precedes it and any rainwater that falls on the colder air may evaporate and saturate the air, giving the appearance of stratus. Sometimes, these clouds grow quickly down and can cause lack of visibility. If the temperature is colder, They can also occur fogs preceding the arrival of the warm front. Heavier clouds (cumulus e cumulonimbus), although they are more common in cold fronts, They can also occur with warm fronts. 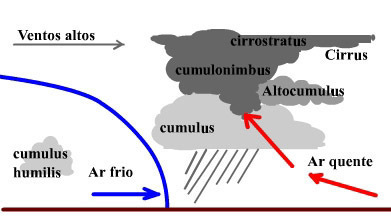 occasionally, when the warm air rises is unstable and temperatures on both front sides are contrasting, cirrus may be followed by cirrocumulus and after cumulonimbus and thunderstorms. A hot ahead is symbolically represented by a solid line with semicircles pointing towards the cold air and the direction of motion.